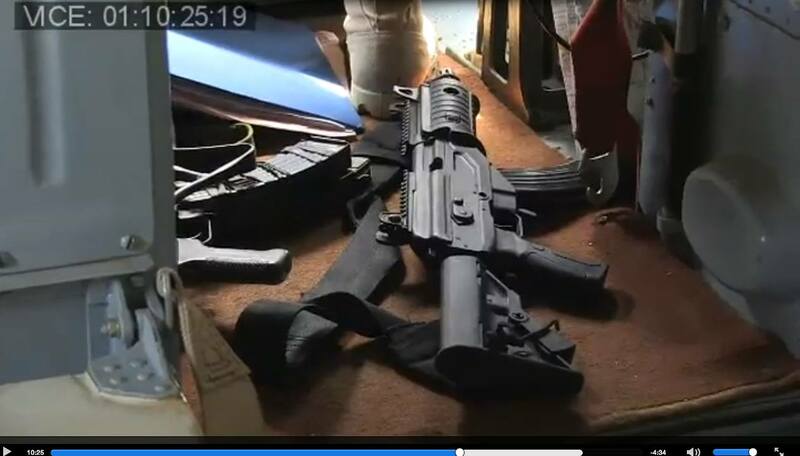 The image above, a still from an upcoming VICE documentary, shows a Galil ACE Model 21 carbine reportedly in the possession of the Sudanese People’s Liberation Army (SPLA) Air Force. The ACE family is based upon the earlier Galil rifles, with updates to improve ergonomics and offer modern features and accessory mounting options. The ACE family is comprised of models in 5.56 x 45 mm, 7.62 x 39 mm, and 7.62 x 51 mm, with weapons in each calibre available in up to 3 different lengths. Whilst some sources have claimed the ACE series was originally designed and developed by Indumil of Colombia, the official statement from Israel Weapons Industries (IWI) is that IWI was responsible for initial development. IWI note that Indumil is licensed to produce major component groups of the 5.56 x 45 mm variants for the exclusive use of Colombia’s armed forces. Chambered for 5.56 x 45 mm, the Model 21 is a compact, short-barrelled, gas-operated assault rifle with selective-fire capability. The example in the picture shown features a 35 round magazine and collapsible buttstock. Sources indicate that several more of these weapons have been seen in South Sudan recently. One possibility is that the ACE rifles may have been supplied by Uganda; the UPDF are known to use the ACE rifle. Special thanks: Aris Roussinos and Julio Montes. Official statement from Ronen Hamudot, VP Marketing for IWI.